This elegant model is from Louis Vuitton and is the Heures du Monde which is apparently in honour of the company’s roots as a travel-trunk manufacturer. The case is in fine finished stainless steel at 44mm diameter, with interesting lug shapes. 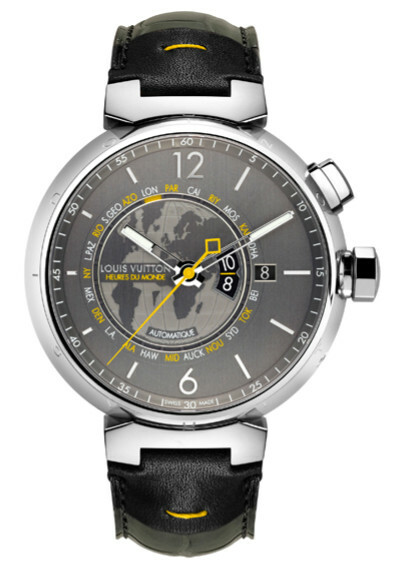 It features a Sapphire crystal with anti-reflective coating under which lies the satin gray dial, which with the offset world map certainly has a different look. 24 City abbreviations/time zones are in yellow and white alternately around the globe and a GMT function allows the traveler to check time in two time zones simultaneously. Note the two Date apertures – the one on the right of the standard Date window is actually a “jump” hour display which indicates the current hour in the tracked time zone and differentiating from day and night in white or gray. Time zone selection is by use of the pusher @2 and a small corrector is located @4 for daylight-saying compensation. Note too the small yellow zone indicator within the globe track index. The analog hour and minute hands are infilled with Superluminova and the long yellow sweep center seconds hand adds good contrast. There is also an exhibition back through which you can see the automatic movement and rotor, which of course is engraved with the LV logo. The watch incidentally is also water Resistant to 50m. Movement wise this model features a Swiss in-house Cal. LV101 21 jewel Automatic with a 40 hours power reserve. Finally this model features a very stylish gray alligator and black calf leather bi-material strap with yellow stitching, which reflects the iconic Louis Vuitton luggage look. So what price fashion ? Whilst I’m quite taken with this model especially from a Fashion House rather than a traditional watch Brand, my concern has to be the Price which is around $9500. I assume the high mark up is due to the position Louis Vuitton commands within the fashion world, but from a watch value viewpoint? It’s a nicely designed and finished watch, looks good, with decent quality features, sapphire crystal, reasonable movement (though no details), a neat World Time function, but no more than that. It is without added value precious metal or jewellery decoration, so basically is a good mid range stainless steel watch, albeit with that stylish “fashion” design, but £6000? It is a fact today that many of the Fashion Houses are coming up with excellent watches, both in terms of quality and technically and with good features, which often display an elegance that some of the mainstream Watch manufacturers are lacking, but the pricing for me is just too inflated. However if you are a lover of and value “Fashion”and you’re prepared to pay for it, on the lookout for an elegant and dressy watch which has some practicality, then this one could easily be for you.